Yes, those nations which once enthusiastically embraced the great Christian Reformation, have now all been taken control of by secularists, who require our children to get a thorough indoctrination into worldly customs and ideologies, via the school systems. And then, after school, they come home and watch TV, radio, or play computer games, or listen to worldly music. And so, if anybody is under the notion that Christians are a free people, they had better realize that this western culture has become one giant indoctrination machine! We and our children are being thoroughly indoctrinated to conform to the image of the Beast, which is, simply put, Satan’s character. This above verse from Mark’s Gospel is a counsel to God’s people to be aware that this abomination of desolation will move into forbidden territory, “where it ought not”, to be. And so, sadly, our various congregations and denominations have become filled with false-brethren, who have a semblance of spirituality, yet are not truly living by faith. Yes, as we take notice of our current-day situation, we can see their cunning deceptions all around us. The sensual music, the giddiness and jesting in our preachers, the pursuit of time-consuming and energy-sapping proud and lucrative careers, the self-absorbing pleasures, pastimes, and amusements, and the morbid desires to explore the oddities of the furthest reaches of Satan’s Kingdom of Babylon, are just a few of the corruptions which have been creeping into the church-world over the past centuries. As this photo shows, there is another Jesus being preached today! And so, the time of our captivity has come to an end. We have now reached the day when God is calling His Church-Faithful out of spiritual Babylon. No, we may not be able to come out of civil Babylon (the world-system), at this present hour! But we can come completely out of spiritual Babylon (the apostate church-world)! Yes, we can immediately begin to “cease ye from Man”, and begin studying the Bible for our own selves, as is written… “But the anointing which ye have received of Him abideth in you, and ye need not that any man teach you:” 1st John 2:27. We can indeed begin to reject all the non-biblical jargon and worldly-minded doctrines, and look at the Scriptures with fresh-eyes, anointed by the daily baptism of the Spirit of Holiness! So just what does this above passage mean? And why does it say that we should pray that our “flight be not in the winter”? Well there is no shortage of speculation as to the meaning of this passage. Many even assign this warning to only the literal Jews. Well, this would make sense, seeing that it speaks of fleeing Jerusalem. Fortunately, there needs to be no speculation about what it means. The Author of the Book has decided to show us just exactly who it is that must flee; and exactly where it is to flee to; and exactly what it is that we must flee from! Because the Author of the Book has written the answer in none other places but in the very heavens! In the very night skies! You see, God has placed the major constellations in such a way, that they tell the marvelous Gospel story in pictures. And a key part of this heavenly phenomena is this Revelation 12 Woman, as she appears to being fleeing. It’s just that we’ve been so conditioned to look at these constellations in a certain way, that we have not seen them the way that God originally intended. WHAT’S THE SIGNIFICANCE OF WINTER? But for those who do begin to see these Bible constellations, there is a very interesting aspect to this: the timing is very revealing. You see, this constellation of this fleeing woman, appears in winter. So what’s the significance of this? You see, this above passage says… “And pray ye that your flight be not in the winter.” And so, God is telling us that we will have to make our flight in winter. So in other words, we didn’t pray; or we didn’t pray enough! But the good news is just this: the place where we must flee to, is also revealed. And it is a place where each and every one of us can get to. The above picture is not a star-chart, but a concept picture. Well, as just stated, the Lord has created a constellation which shows a woman fleeing. 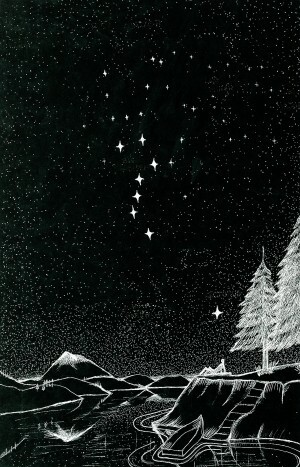 It is called the Revelation 12 Woman Constellation, also known as Ursa Major or The Big Dipper. So if we explore this constellation in the light of the Bible, there can be a wealth of information discovered on this very topic. So come along and dig into this study. And after reading about this heavenly revelation, you just might find yourself fleeing to the mountains. And maybe, just maybe, there are some much better mountains to flee to, than the ones in the above photo of Palestine! Mountains in which you can hide, where tracking devices and black helicopters are useless against you!